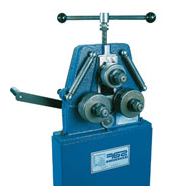 This is a small and portable machine with two driving rolls and a manual adjustable top roll. This machine has a cast iron body, hardened steel shafts and a universal tooling set which allow you to bend most general applications within its capacity. Convieient and portable the small dimensions and reduced weight make it easy to transport. It can be supplied with a base unit or mounted directly on to a work bench.